One in four students was found to be overweight or obese. More than half do not meet the standard fruit and vegetable intake. I believe that children should be given the best chance to engage in physical activity, and that they must be educated to understand the importance of a healthy lifestyle. I am glad to see that ACT Health is beginning to implement a traffic light system in school canteens, with’ green’ healthy foods given prominence over unhealthy ‘red’ high energy ones. Hopefully as a result we may see a decline in child obesity levels, which in the ACT was found to be almost one in five for both kindergarten and secondary schoolchildren. This is why we have created the Healthy Hoops 4 Active Kids program. If we do not address these issues and do not actively encourage our children to participate in physical activity, we may be sending them to early graves. 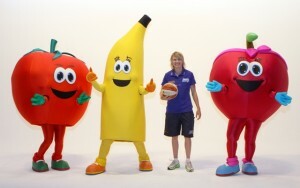 Healthy Hoops is free, it’s fun and is run to teach kids about healthy eating and lifestyle. There is no excuse for findings such as this. Let’s do something about it. Visit www.healthyhoops.com.au for more information.